If you ask Windows users which temporary file cleaning program they use then the chance is high that you get CCleaner as the answer. The popular tool has not lost any of its appeal ever since it was first introduced by its parent company Piriform (I first reviewed the program in 2005). But CCleaner is nowhere near as complete as it could be. This has for instance been shown by CCleaner Enhancer, a program that adds more than 200 different cleaning rule sets to CCleaner. Windows users looking for a CCleaner alternative have several programs at their disposal. I reviewed some of them, like System Ninja or Clear Prog in the past here on Ghacks Technology News. Wipe 2011 is another CCleaner alternative. The program concentrates more on privacy and tracking orientated traces on the system and even identifies data that CCleaner does not find by default. When you first start the program you will notice that it will start to scan the system for tracks and garbage. The delete tracks and garbage option is selected by default. This setting is a click one delete all option, a click on continue would delete all data found by Wipe 2011 during the scan. Users who want more control over the process should switch to the Advanced cleaning mode option which displays the programs findings in list form with options to prevent the cleaning of specific data points on the PC system. The advanced listing displays all of its findings in table form. listed are the type of data search, the files and Registry entries found and the total amount of disk space in bytes occupied by the data. Checkboxes are provided to enable or disable groups or individual titles from the cleanup. CCleaner users will find that Wipe 2011 lists several data locations that CCleaner ignores. Among them the CryptnetURL cache, RSS feeds cache, Direct3D recent program list, game statistics or the recent wallpaper list. A right-click on any title in the Wipe 2011 software opens a context menu with options to view all contents of a particular location in the application or to delete its contents manually. Wipe's missing a backup and restoration option. The program can wipe data permanently from standard platter driven hard drives. Users who want that need to switch from standard deletion to anti-recovery overwrites in the program settings. 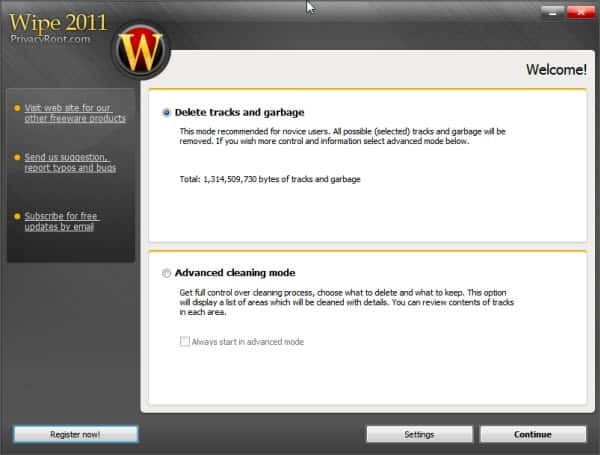 Wipe 2011 is a handy CCleaner alternative with a focus on privacy and tracking related data. Windows users can download the program from the developer website. The application is compatible with 32-bit and 64-bit editions of the Microsoft Windows operating system. I never did like CC Cleaner as it did some nasty things to my system and, as you stated, it omitted many entries that needed to be cleaned. I’ll give Wipe a try! If they require payment as Dean indicated, in order to access all the functions, then I’ll have to give it some thought! I’m curious as to what “nasty things” CCleaner did to your system. I’ve been using it for years and never had any ill effects. Will Give this one a try … Though there is no reason for me to switch from CCleaner … it has NEVER (file cleaner or registry cleaner) done anything harmful to any of my systems in YEARS of use. Used CCleaner for years, back when it was still called Crap Cleaner. I am leery of the Registry cleaner portion of it. It borked my Nero burning software about 5 years ago. I do think its improved since then. I use it once in a while, but usually use Glary for registry cleaning. I especially like the Cookie Manager. Thanks for the review of Wipe 2011. Will pass on it for now. I recommend this one for advanced users, maybe to complex and powerful! Any alternatives for the actually track record provided by CC? A Chevy with lots of “bells and whistels” is not an alternative for a stripped down BMW. I personally see alternative as a very broad term. The program does not really have to be better, worse or identical in functionality to qualify for that term. I just sent this message to CCleaner. What in the Hell makes you think that you have the wright to install Google Chrome on my computer without asking me? How much is Google paying you to sneak Chrome onto every computer that instals CCleaner? Chrome makes itself the Default Browser and nothing can be done to return Foxfire as my Default Browser. I have spent hours searching and trying everything and still can not set Firefos as default. I am MAD, VERY MAD! I am going to spend more hours finding every review site on the web and posting about your DIRTY LITTLE DEAL with Google Chrome. The word IS going to get out!!!!!!!!!!!! Opensource alternative: “Bleachbit” cleanes everything. Its just called Wipe now seems to remove a lot that others dont including Cryptnet url cache etc. I have CCleaner-BleachBit -Privizer they all seem to leave something for each other to remove. But uninstallers do the same dont believe them when they say -its all removed -it isnt.